Takashi Murakami, Lots, Lots of Kaikai and Kiki (detail), 2009. Acrylic and platinum leaf on canvas mounted on aluminum frame. 300 x 608 x 5.1 cm (9 ft. 10 1/8 in. x 19 ft. 11 38 in.x 2 in). 5 panels. Private collection. © 2009 Takashi Murakami/Kaikai Kiki Co., Ltd. All rights reserved. Takashi Murakami, Dragon in Clouds—Red Mutation: The version I painted myself in annoyance after Professor Nobuo Tsuji told me, “Why don’t you paint something yourself for once?” (detail), 2010. Acrylic on canvas. 367 x 1800 cm (12 ft. 1/2 in. x 59 ft. 5/8 in.). Courtesy of the artist. © 2010 Takashi Murakami/Kaikai Kiki Co., Ltd. All rights reserved. Contemporary works by Takashi Murakami, one of the most imaginative and important artists working today, are juxtaposed with treasures from the MFA’s renowned collection of Japanese art. The exhibition reveals how Murakami’s contemporary vision is richly inflected by a dynamic conversation with the historical past, framed by a creative dialogue with the great Japanese art historian, Professor Nobuo Tsuji. Together, Murakami and Professor Tsuji have chosen the objects on view in the exhibition, including paintings and sculpture created by the artist in direct response to Japanese masterpieces from the MFA’s collection, such as Soga Shōhaku’s 35-foot-long Dragon and Clouds (1763) and Minister Kibi’s Adventures in China (12th century). Generously supported by the Carl and Ruth Shapiro Family Foundation. Additional support provided by Davis and Carol Noble and an anonymous funder. Presented with support from the Corporate Innovation Consortium: Vertex Pharmaceuticals, General Catalyst, Leerink Partners, and the Shah Family Foundation. 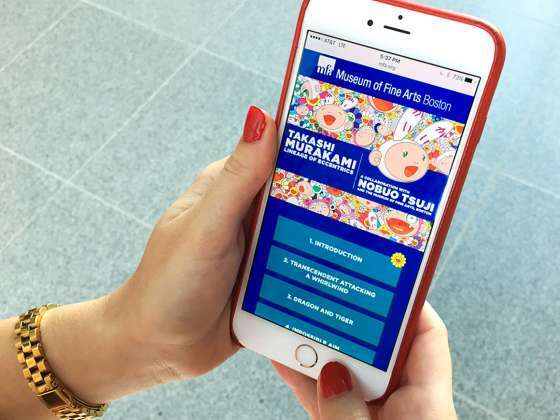 Dive deep with a mobile tour of the exhibition by streaming the MFA Mobile.